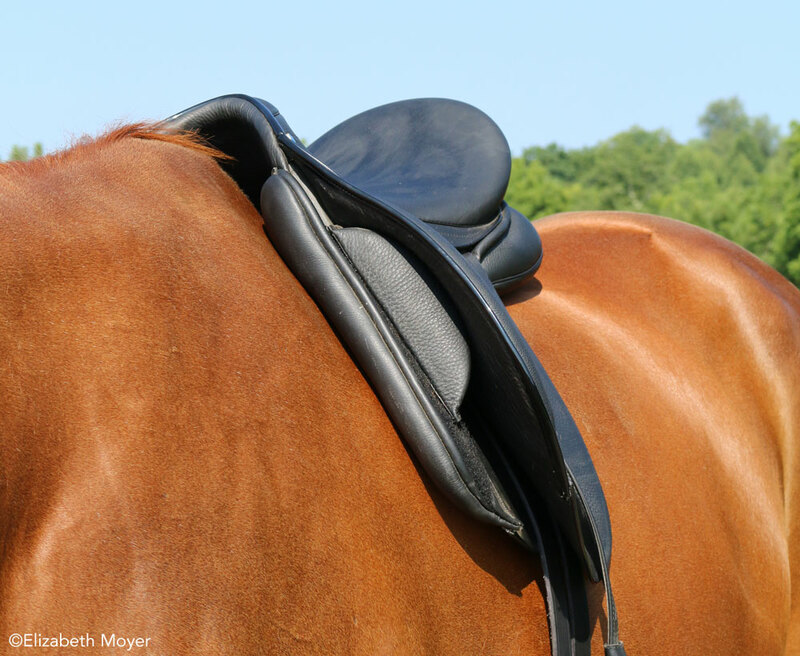 Find out if your English saddle is a good fit for your horse. There are so many things to think about when you’re riding. Is my position correct? Is my horse moving right? But one big factor influencing your horse’s way of going that you may never have thought about is saddle fit. Imagine what it might feel like to your horse if there is an uncomfortable pressure point digging at his back every time your weight touches the saddle. Not very good! And he certainly won’t be able to relax and do his best work until he’s in a saddle that fits well. This saddle looks like a promising fit, clearing the withers by the right amount. Saddles are built on a frame called a tree, usually made from wood, although some are plastic, metal or carbon fiber. The shape of the tree determines the fit and width of the saddle. English saddles come in different widths to fit different types of horses: usually narrow, medium or wide. 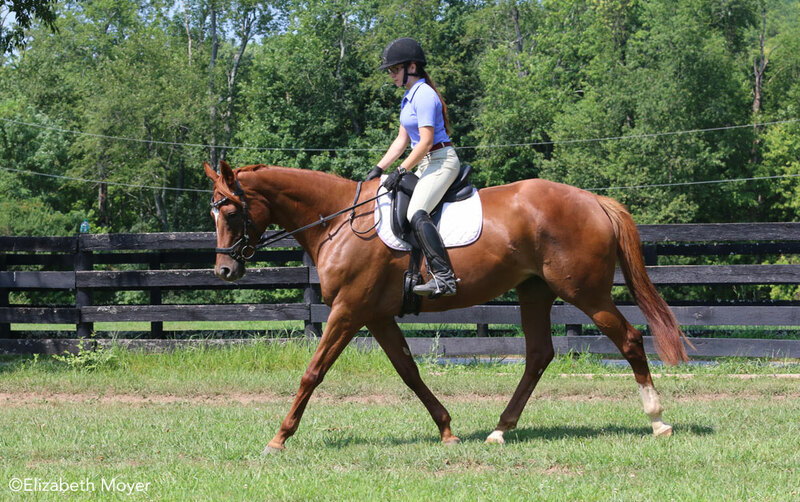 To evaluate how a saddle fits your horse, skip the saddle pad and put the saddle directly on your horse’s back. Start by looking at wither clearance. Does the pommel sit down and touch the withers? Does it arc up really high above them? 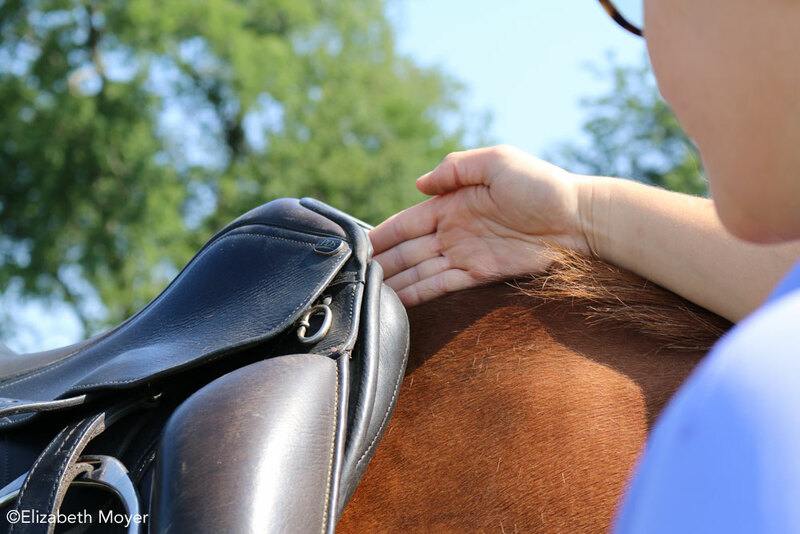 See how many fingers fit between the withers and pommel when your saddle is in the correct spot—girth it up to make sure it’s staying securely in the spot where it sits when you ride. This saddle is clearly too wide, and sits nearly all the way down on the withers. If the pommel sits close to or is touching the withers, it’s likely too wide for your horse’s back. You need at least a few finger widths of clearance. A saddle that’s too wide may also tilt down in front. If the saddle is perched four fingers or more above the withers, it is probably too narrow for your horse. A too-narrow saddle may sit high in front and slope back toward the cantle. Too narrow: This saddle sits very high off the withers, more than four fingers. If the wither clearance looks good, check that the saddle is sitting level on your horse’s back, not tilted up or down like a ski slope. Look at the deepest part of the seat to check that it’s in the right place. 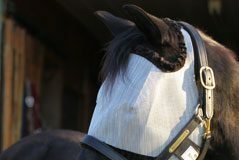 The padded panels on the underside of the saddle need to make even contact with your horse’s back. 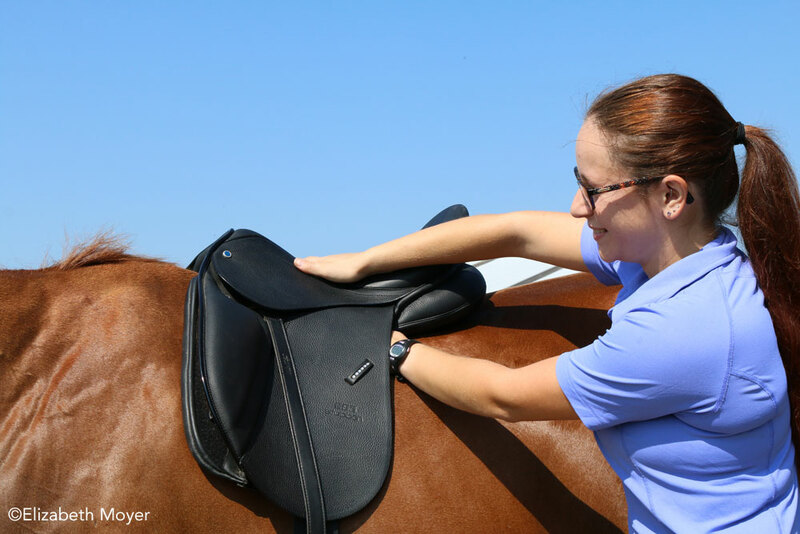 This part of saddle fit is based on your horse’s back shape. 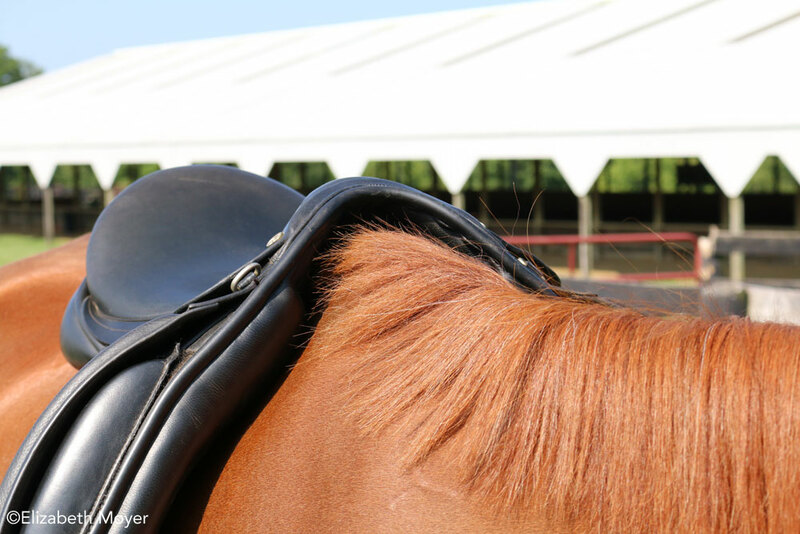 Set the saddle on your horse’s back with no pad or girth. Hold the pommel and cantle and try to rock the saddle like a rocking horse. If it has a lot of rock, this will cause a pressure point under your seat where all of your weight is concentrated­—ouch! Use one hand to press down on the seat where your weight would be. Next, lift the flap and slide your other hand under the saddle’s panel, starting at the front. Move your hand toward the back of the panel, checking to see if it makes even contact along the middle of the horse’s back. If it’s not, the saddle is “bridging,” which will cause pressure points at the front and back of the panels, with no weight distribution under the rider’s seat. Ouch again! Feel for bridging (a gap) under the middle of the panels. A saddle fitter might be able to adjust the flocking or padding inside the saddle to solve minor problems with rocking or bridging, but often the shape of the tree just isn’t the right fit for a particular horse. If the saddle looks like it fits well from the ground, it’s time to go for a test ride to see how your horse goes in it. You probably already know if you ride a round pony that’s shaped like a barrel (no prominent withers) that you need a very wide saddle. If your lean Thoroughbred feels like sitting on the fence with your legs hanging straight down, he is quite narrow! That’s a great starting point, but the bottom line is that you will probably have to try several saddles on your horse to find one that fits best. You can usually try new saddles from your local tack store for a few days if you are careful to prevent stirrup marks. Online retailers of new or used saddles often offer trials as well, but shipping costs with this method can add up. Sometimes you can get very lucky and try a saddle that a friend is selling and have it be a great fit. 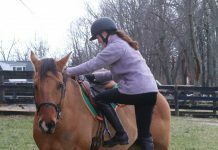 Your riding instructor or an experienced horse person can help you check the fit of your saddle. You can also make an appointment with a professional saddle fitter to try different saddles on your horse and see what he (and you!) like the best. If you have a saddle that fits OK but not perfectly, there may be hope. If the saddle is just a little too wide, a thick half pad will help you get some clearance off the back. If the pommel or cantle is too low, you can try a riser pad to lift the front or back of the saddle. Saddle pads with pockets to add felt or foam “shims” can also help make custom adjustments where needed. With a saddle that is too narrow, there is nothing a pad can do. Unfortunately, you’ll need to get a different saddle for that horse. Also, remember that while padding can help fit, it doesn’t fix the problem. Ultimately, a properly fitted saddle is the best solution. While fitting your horse comes first, you won’t be able to ride your best if the saddle doesn’t fit you, too. Saddles come in different seat sizes. On an English saddle, this is measured from the nailhead on the pommel to the center-top of the cantle. A saddle that is too big or too small will make it hard for you to stay balanced and keep your leg under your body. Your seat should be in the deepest part of the saddle with about one hand width behind you to the highest point of the cantle. The angle and length of the saddle flap can also affect how the saddle fits a rider. If you have long legs, you may need a forward flap.